Brushing is important for oral care in children right from the teething stage. First Step Toothbrush comes with small rounded head, ideal for a child's mouth extra-soft bristles to massage the gums and clean the teeth. Ergonomic handle covered in soft, non-slip rubber for extra grip. 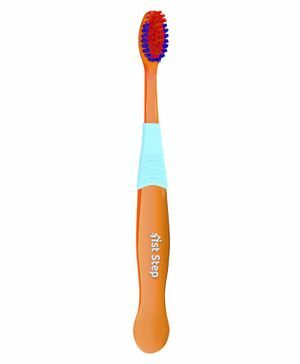 This toothbrush has been specifically designed for a simple, effective & comfortable start towards your baby's good oral hygiene. Wash in warm waster using mild cleanser and rinse thoroughly in clean water. Toothbrush can be sterilised by immersing in baby sterlising sollution.